Did you ever wonder what will the world be like in 10 years from now? Or how will the future kitchen look like? 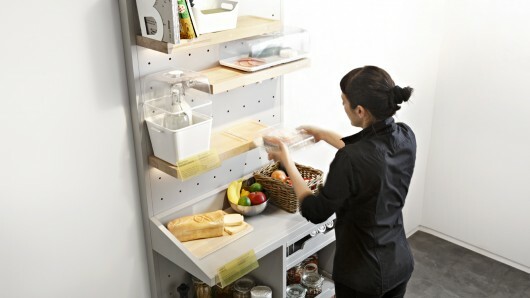 Well if you didn’t, Ikea’s Concept Kitchen 2025 did it. Scroll down for the video. The design firm IDEO London in collaboration with the students from Lund and Eindhoven universities developed the Concept Kitchen, a prototype for the Expo Mila in Milan, invented to increase people’s creativity towards food and eco-friendly lifestyle. ‘The exhibition is just one part of an ongoing investigation by Ikea into how people’s relationship to food is changing,’ Ikea says on its website. Ikea designed a smart kitchen table that can show you the cooking options by sensing the food placed on its surface. Any missing ingredients can be quickly delivered by drones or by self-driving cars, while you are guided one step at a time through the recipe by projections on the table. All these things are possible due to a camera and a projector placed above the table. When you’re finished cooking, food storage containers with hidden sensors and smart induction cooling technology replace the refrigerator by keeping the product at the proper temperature on shelves, based on the idea that 10 years from now, no one will be shopping weekly. You will also be alerted which food needs to be consumed, before it’s validity term. 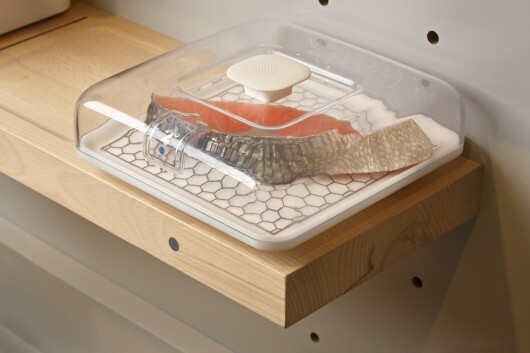 An in-kitchen device can compress leftovers into dry, odourless packages. The magical table could be also used as a stove, using induction coils underneath the surface that can be used for cooking and charging portable devices. The Swedish furniture retailer unveiled last month that the new collection will use Qi wireless technology to power-up compatible devices that are placed on or near the furniture. The Home Spot range of desks, bedside tables and lamps will hit stores in Europe and North America next month. Jeanette Skjelmose, lighting and wireless charging business manager at Ikea, said: ‘Through research and home visits, we know that people hate cable mess. Qi is said by its developers to be the most widely-used wireless charging type, and can be used in 3,000 public locations globally. There are now more than 80 Qi-enabled smartphones available. Among these are models of the Nokia Lumia, Samsung Galaxy, Google Nexus and Sharp Aquos. 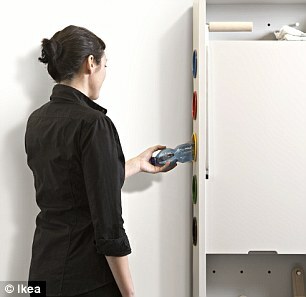 ‘Over 60 per cent of the world’s population will live in urban centres,’ Ikea said in a statement. 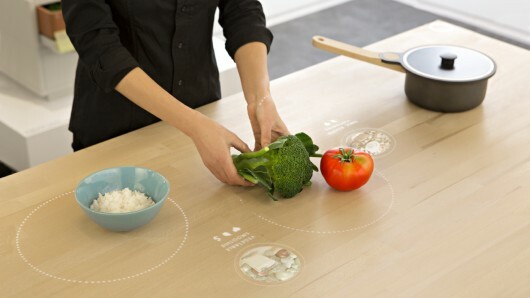 The video below shows how the smart kitchen table of tomorrow might work.